On around 100,000 m² we offer a wide range of options to meet your needs, from the block storage to small parts storage, consignment and high-bay warehouses to food and pharmaceutical warehouses. State-of-the-art industrial trucks are used for a process-optimized putaway and retrieval. We offer tailor-made transport on land, on water and in the air. From commercial goods over food and medicines to complete machines we carry all goods reliably and competently. The organization and the transportation itself is executed by qualified specialist personnel. With the use of state-of-the-art technology we bring your groupage as well as partial and complete loads safely, on time and reliable to its destination! TRANSCO PHARM, with their 24 years of experience, developed as a service provider in the field of pharmaceutical logistics and pharmaceutical forwarding and realized complete TRANSCO pharmaceutical concepts for highest processes, qualified, safety, qualification and documentation. With the project “Secure cold chain”, which has already begun in 2011, we have fully prepared ourselves to the new requirements of the“GDP-Guideline 2013”. TRANSCO PHARM is fully compliant with qualified processes, qualified staff and the latest technology. Concerning the development of individual logistics systems, we are at your service in alignment with the highest quality and safety standards. We work with you on the development of solutions that fully match your goods flow, values and information flow. Complete planning, network control and synchronization of complex global, Europe-wide and national logistical value chains for well-known customers from automotive, pharmaceutical and consumer goods industry have already been implemented.Assignment as lead logistics provider, design of outsourcing projects and in-house forwarding. The growing dynamic of the markets creates growing demands on the quality of the material and information flows of our customers. The shorter product cycles, as well as the diversity of variants, especially in the automotive industry, now demand intelligent company-specific solutions. Therefore, we not only see ourselves as a partner for warehousing, but also as a partner for individual logistics concepts and sophisticated services. In this context we have many years of experience in the order picking, implementation of work processes according to SOP orders, implementation of lean management, production control via KANBAN, as well as manual ident control. From London to Prague to Florence: in all major metropolitan areas of Europe TRANSCO is represented with their own branches and/or partners. This stable network makes Europe-wide logistics solutions possible. We place great value on qualified multilingual staff on-site in order to ensure a simple and uncomplicated communication. With our know-how, our market knowledge and connections – also to Eastern Europe - we are able to implement demanding and individual logistics solutions in and outside of Germany for you. TRANSCO operates in the high-tech project logistics for decades. For the Europe-wide introduction of highly sensitive electronic components special loading containers and vehicles as well as long-standing experienced employees are at your disposal. Tailor-made loading aids and load securing modules complete the requirements in this area. Our schedulers are at your side with a high degree of commitment when it comes to competent, complete planning and control of complex information and material flows. Individual consulting included - talk to us! 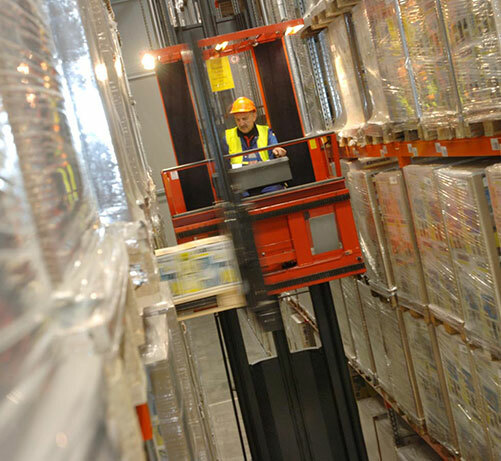 For our customers in the pharmaceutical and food industry, we offer two high-quality, temperature-controlled warehouses with over 6,000 high-rack slots on approx. 2,000 m². It is a closed, autonomous area with 4 loading ramps, office rooms and sanitary area. The storage facilities are equipped with video-monitored exterior doors, access system for authorized personnel only, independent temperature monitoring, an integrated alarm system for the monitoring of the min/max values (GDP-compliant), glass-breakage-safe lighting (HACCP-compliant), monitoring for pest prevention, fixed cleaning plans and modern industrial trucks.